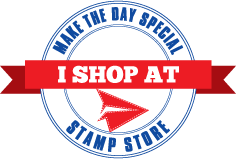 Make The Day Special Stamp Store Blog: Snowflakes and Sequins. Jill here, and this week, I am eventually facing the fact Christmas is around the corner! I started by inking up a piece of watercolour card using Distress Ink, (Peacock Feathers and Broken China), creating a dark to light gradient, and adding a shimmer by spritzing with water mixed with mica powder, finishing with a few flicks of white. Once I was happy with my background, I took my Lil Inker's Snowflake's Die, and cut three from my background, (leaving me 3 pretty snowflakes I can use on another card). I was going to simply add a layer of vellum behind, but when I see a chance to add a wee little shaker to my card, well, I just can't pass it up! So added some sequins and glitter behind each little flake. I cut Mama Elephant's Merry Script Die and coated in a couple of layers of red embossing powder to give it a really high gloss. I finished my sentiment by white heat embossing a simple 'Christmas', from Lawn Fawn's Trim the Tree, on black card, and cut into a banner. I added a wrap of bare twine and a cute little bow, and adhered my greeting over the top. I added some silver Stickles around my snowflakes, and a scattering of sequins to finish off, and there you have it. I really hope you like it, as always, everything I used is linked below, and below that, the stunning creations that inspired my project. and this beauty from Giovana Smith. Gorgeous card and gorgeous inspiration, thank you. Just stunning, Jill - love the gradient of colour and the pop of red from the sentiment!